※Create your own theme. ※If you forget your board, you may not be able to participate. 9th. May. 2019.~26th. May. 2019. Note: The photo session may be cancelled if the number of participants doesn’t exceed10. 7th. Jul. 2019. 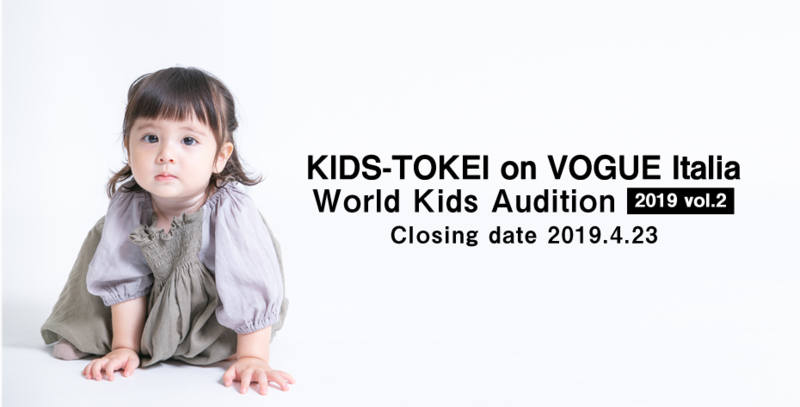 The announcement will be made on KIDS-TOKEI official website ! ※If you are absent without notice, there is a possibility that your child may be cast out from the selection in the future. ※If you cannot attend the day of the photo session, you can change it 8 days before Photo session as a general rule. ※Please do not change the date of the photo session 7days prior to the photo session. ※You can check the result and details of the photo session on ‘My page’. ※The announcement of the result may take several days, depending on the number of applicants or screening. We kindly ask for your understanding. Q.What kind of photo session will I have? A.Portrait photo sessions by professional photographers. come with your best clothes! Q.Can I take my own videos or photos during the session? A.Please note that taking photos and videos with your own devices are not allowed. Q.Are there any rules for decorating my Message Board? A.Yes. Use a black sheet of paper. The size should be B4 (25.7cm x 36.4cm). Q.Can I purchase the photo data? A.Yes. Photo data can be purchased. It includes both published pictures and behind the scenes photos. Q.When is the release date? A.The date when models will appear on KIDS-TOKEI website. Q.Can you give me the published images of my child? A.You can save the images after one week of its release. Note:The resolution of the free download images are not so high. Q.I’ve changed my e-mail address. What should I do? A.Please change your registered E-mail address on "Mypage" with your smartphone or PC. You can find the bar saying "Change E-mail address" in the menu list. Q.Can KIDS-TOKEI CLUB help my child become an actor/actress or a model? In fact, some KIDS-TOKEI models made their debuts in magazines, fashion brands or TV shows. We continue to offer the chances to connect you to the world of show business !